The Global Volcanism Program has no activity reports for Tindfjallajökull. The Global Volcanism Program has no Weekly Reports available for Tindfjallajökull. The Global Volcanism Program has no Bulletin Reports available for Tindfjallajökull. Tindfjallajökull is one of the oldest late-Quaternary volcanoes of the eastern volcanic zone of Iceland, and has produced rocks of basaltic-to-rhyolitic composition. Eruption of the rhyolitic and trachyandesitic Thórsmörk Ignimbrite accompanied formation of a 5-km-wide caldera about 54,500 years ago. The NW rim of the caldera is topped by an icecap. About a dozen small eruptions took place during the late Pleistocene or early Holocene, mostly from vents north and west of the caldera. The Global Volcanism Program is not aware of any Holocene eruptions from Tindfjallajökull. If this volcano has had large eruptions (VEI >= 4) prior to 10,000 years ago, information might be found on the Tindfjallajökull page in the LaMEVE (Large Magnitude Explosive Volcanic Eruptions) database, a part of the Volcano Global Risk Identification and Analysis Project (VOGRIPA). There is no Deformation History data available for Tindfjallajökull. There is no Emissions History data available for Tindfjallajökull. Tindfjallajökull, one of the oldest late-Quaternary volcanoes of the eastern volcanic zone of Iceland, is seen here from the ESE. The Thórsmörk ignimbrite accompanied formation of a 5-km-wide caldera during the Pleistocene. 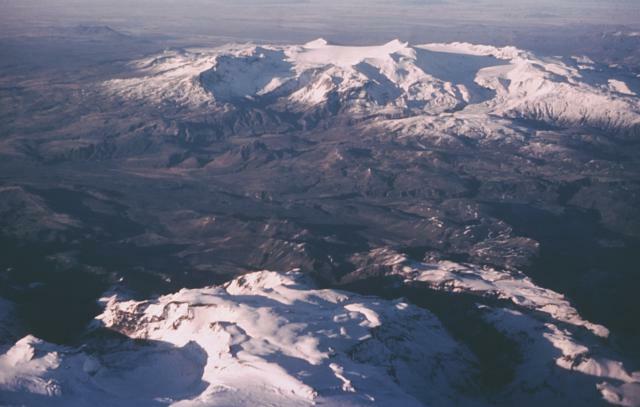 The NW rim of the caldera is overtopped by the Tindfjallajökull icecap, which forms the smooth flat surface at the summit. About a dozen small eruptions took place during the late Pleistocene or early Holocene, mostly from vents north and west of the caldera. Photo by Oddur Sigurdsson, 1976 (Icelandic National Energy Authority). The Global Volcanism Program has no maps available for Tindfjallajökull. There are no samples for Tindfjallajökull in the Smithsonian's NMNH Department of Mineral Sciences Rock and Ore collection. Catalogue of Icelandic Volcanoes (Link to Tindfjallajökull) The Catalogue of Icelandic Volcanoes is an interactive, web-based tool, containing information on volcanic systems that belong to the active volcanic zones of Iceland. It is a collaboration of the Icelandic Meteorological Office (the state volcano observatory), the Institute of Earth Sciences at the University of Iceland, and the Civil Protection Department of the National Commissioner of the Iceland Police, with contributions from a large number of specialists in Iceland and elsewhere. This official publication is intended to serve as an accurate and up-to-date source of information about active volcanoes in Iceland and their characteristics. The Catalogue forms a part of an integrated volcanic risk assessment project in Iceland GOSVÁ (commenced in 2012), as well as being part of the effort of FUTUREVOLC (2012-2016) on establishing an Icelandic volcano supersite. Large Eruptions of Tindfjallajökull Information about large Quaternary eruptions (VEI >= 4) is cataloged in the Large Magnitude Explosive Volcanic Eruptions (LaMEVE) database of the Volcano Global Risk Identification and Analysis Project (VOGRIPA).